If Trumbo represents the dark side of communism in 1950s Hollywood, then the Coen Brothers’ new film Hail, Caesar!, which opens area-wide on Friday, offers a much lighter analysis of the era. The theme comes to the fore after a few movie extras kidnap Baird Whitlock (George Clooney), who's still decked out in sword and sandals, from the set of a biblical period piece and take him to an oceanside villa where a group of radical writers have gathered. Calling themselves the Future, the writers along with scholar Herbert Marcuse (John Bluthal) discuss how a few elite Hollywood producers have taken control of the means of the production. And they want to take it back, so they send a ransom note to the studio. Gullible enough to fall for their half-baked philosophies that only seem partially derived from Marx, Baird engages in lengthy discussions with the group and adopts their principles (until he literally has the thoughts slapped right out of him). All the while, a number of other studio-related issues require the attention of a certain Eddie Mannix (Josh Brolin), a “fixer” whose job it is to keep the stars out of the tabloids. Laurence Laurentz (Ralph Fiennes) can’t cope with Hobie Doyle (Alden Ehrenreich), a cowboy-turned-actor who’s better at twirling a rope than delivering a “mirthless chuckle,” and DeeAnna Moran (Scarlett Johansson) has become pregnant out of wedlock. With all this commotion going on, sisters Thora and Thessaly Thacker (Tilda Swinton) constantly hover like some kind of vultures, hoping to get exclusives for their respective gossip columns. At least one critic has noted that the film features five movies inside the movie. You can't get more meta than that! The song-and-dance flick starring Channing Tatum as a flamboyant sailor stands out from the pack that includes costume melodramas and a goofy Western about how a full moon can drive a man mad. 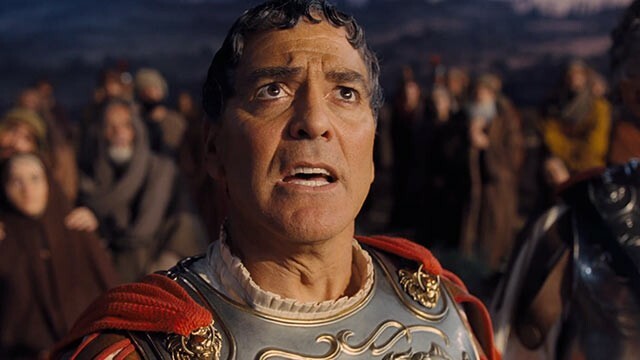 In the end, the light-hearted Hail, Caesar! works effectively as satire, lampooning the Hollywood of yesteryear while adding a bit of mystery to the mix. Woody Allen used to make movies like this before he became morose and self-involved. George Clooney Is Here! George Clooney Is Here!